Remember those paint-by-number kits you played with as a kid? They almost guaranteed you would create a near-masterpiece, as long as you matched the right color with the same-numbered section on the outlined picture. Fast-forward a few decades, and if you’re the typical homeowner, your wish list might include a home exterior paint-by-number kit. Those helpful kits exist in a sense. Paint companies employ color experts and consultants who make it their business to combine exterior and interior paint colors into pleasing palettes. Creating a stunning exterior paint scheme can be as simple as choosing a color card you like and applying the matching paints to your home in paint-by-number fashion. But wait – isn’t color supposed to make a personal statement about you and your home? Perhaps as a child you were bored with the predictable outcome of paint-by-number kits and can’t imagine using a similar technique to select color for your home. Don’t worry. We’re not steering you into a humdrum, cookie-cutter color scheme. This approach to color selection – from the editors at Better Homes and Gardens® magazines – takes into account your personal style, your home’s architectural style, and your favorite colors, allowing you to borrow ideas to make a personal statement. Your favorite color is purple (or orange or pink). Better save that hue for accents such as pillows and a throw inside your home, right? Wrong. Example: Even an atypical exterior color palette of violet, navy, and gray can look stunning when applied in the right shade with the right supporting colors. Body Color: Think of polished silver... a delicate color offers a neutral backdrop to the bold accents on the trim and door. Trim Highlight 1: A silvery white that complements the cool tone of the body color and provides crisp detail for window trim and porch posts. Trim Highlight 2: A classical violet – a soft purple with red undertones on the shutters warms the cool colors on the body of the house. Accent: This deep violet/navy color makes the front door pop while staying true to the sophisticated palette. If your preferred brand of paint features your favorite hue only in an interior palette, ask if the color can be mixed for an exterior paint. Most interior color schemes feature three or four colors, just as most exterior palettes do. Visualize the interior wall color as the exterior body color. Choose an interior accent color – such as the one used on woodwork or window treatments – as the exterior trim highlight. Look to the third interior accent color – likely used on accessories or furniture – for your exterior accent color for the front door and possibly the shutters. You live in a historic-style home (or are about to built one) and would like to do justice to the architecture. Several paint manufacturers offer preservation or historical paint palettes. The companies’ color experts did the research for you by tracking down historically appropriate colors and grouping them in pleasing combinations. Body Color: A medium blue-green. This color functions as a neutral and offers period-appropriate contrast to the warm tones of the trim and accents. 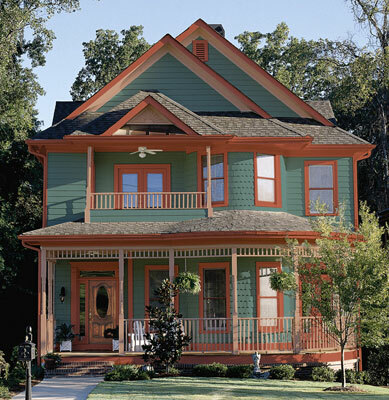 Trim Highlight: Try terra cotta colored trim. The rich, warm terra-cotta offsets the body color and accents historical details such as the moldings. Accent: A soft rose beige. 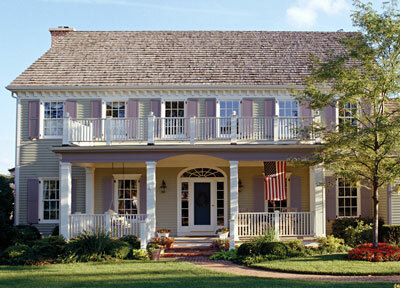 Against the backdrop of the siding and trim, a pale accent color brings the porch details to the forefront. If you’re a history buff but don’t live in a historic home, you can still enjoy color steeped in tradition. Enjoy paint colors that replicate styles of historical times and landmark American buildings, such as The Homestead in Hot Springs, Virginia, and Oatlands in Leesburg, Virginia. Apply the colors used on these dwellings to almost any style of home for a touch of history. Look to your favorite activities and interests for color inspiration. For the nature lover who hits the trails at every opportunity, try colors from the outdoors. If you don’t think in "black and white", don’t paint your house in those colors. Cloak your home in an element of your personality. Body Color: Try thinking of the haze in the mountains. A soft gray-green creates a subtle backdrop for the more saturated natural hues of the trim and accent. 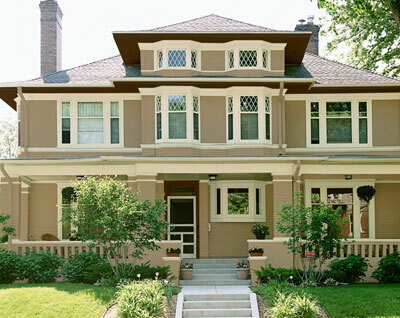 Trim Highlight 1: An earthy brown softens the look of wide trim and support columns. 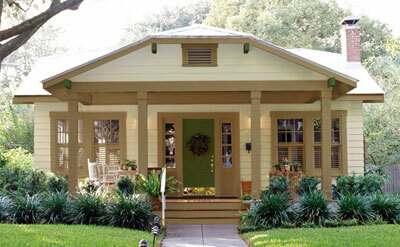 Accent: A saturated yet subdued green makes the front entry stand out. Gather inspiration from the interior of your home to translate to exterior colors. Typically people are more comfortable using a color that makes a personal statement in a bedroom, dining room, or kitchen. But with the right color choices, the exterior and interior of your home will make a cohesive statement about your personality and design tastes. Your house or landscape may dictate some color choices. A partial brick or stone facade, for example, would be expensive to replace just to change the color of your home. Look at these exterior features as color inspirations rather than limitations. Body Color: Here, the existing brick – with a paint color closely matching it – functions as the body color for the whole house. Trim Highlight: A greenish gray complements the warm tones of the brick and helps to balance the upper and lower levels of the home. 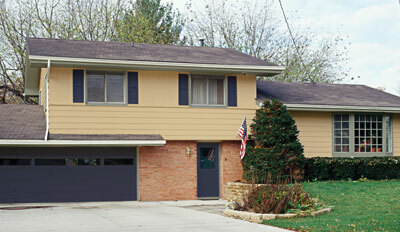 Accent: A deep blue-purple is applied to the garage door, entry door, and shutters. This deep shade offsets the evergreens in the landscape and gives visual weight to the garage. Sheen plays an important role in how exterior paint will look and function. Typically, flat or satin finishes – those with the least shine – are used as the body color on siding, masonry, and stucco. These finishes help hide imperfections. Semigloss and gloss finishes generally are used for accent colors applied to trim, shutters, and doors. These high-shine finishes are durable and highlight the details that make a home stand out among its neighbors. Sometimes originality doesn’t count. Many exterior color cards from paint manufacturers feature homes lush with curb appeal, thanks to stunning color combinations. Start with these helpful color combinations as the colors to replicate the look are listed on the back of the cards. Then look at options to fit your house features and landscaping. Body Color: A warm stone gray-brown. This natural hue helps the home blend into its surroundings and softens the lines of an imposing exterior. Look for a gray that is close to brown with red undertones, not cool blue undertones. Trim Highlight: This soft, creamy white is more appropriate with the beige/gray body color than a cool, stark white. Accent: This deep, near-black hue is dramatic on the door. Nearly every paint manufacturer offers color-combination inspiration. Pick several booklets and cards that feature palettes you like. Keep in mind that a variety of factors affect how the colors actually look on the exterior of your home. Don’t rely only on the color swatches. Narrow your selection to a couple of palettes and purchase small paint samples of each. Then paint large sample boards – or even a portion of the back of your house – with each color. Look at the colors at different times of the day and during sunny and cloudy moments before making your final selections.